Editor’s Note: When I started my investing journey four years ago, the first book I ever picked up was the Bogleheads’ Guide to Investing. Looking back, I’d say this book was the absolute best thing that ever happened to me(finance-wise) since it really opened up my eyes to low cost index funds and the basics of investing. In fact, it’s probably the book I recommend the most to anyone just starting out on their investing journey. I’ve been wanting to review it for a while as part of my new book review series, but since I read it so long ago I didn’t really remember all the important details. Luckily, one of my faithful readers and longtime friend, Erik Sierks, graciously volunteered his time to review the book. Erik is a fellow aerospace engineer and UC San Diego Volleyball Alumnus who is really just getting started on his investing journey. Erik’s been working for a couple years now but he’s been slowly gaining more and more of an interest in personal finance. He was one of the first people I convinced to take advantage of an HSA and based off his review below, it looks like he’s got a great foundation of knowledge to build on going forward. I’ll be giving away two copies of the book to two lucky readers! If you’d like to be entered to win a copy of the book please leave a comment below. On to the review! After 15 years of school I have learned a lot of really important skills: I can read and write, add and subtract. I also learned a lot that has been pretty useless (even working full time as an engineer!) like differential calculus and linear algebra. All these skills are supposed to help get me get a job, make money, and become financially independent. So how is it that I, like many other college graduates, made it this far without learning what to do with my money once I start making it? Unfortunately, there is very little exposure to money management in school. If you are like me, and want to know how to take control of your own financial future, The Bogleheads’ Guide to Investing is a great place to start. What it is: An overview, guidelines, rules of thumb, in layman’s terms: a roadmap to a comfortable financial future. The Bogleheads’ Guide begins by asking you to lay out the ground rules for a stable financial future. Take an inventory of your current financial situation. Eliminate high interest credit card debt. Set up an emergency fund. It is important to begin down the road toward your financial goals from a firm starting place. Once you have taken care of the basics, then its time to start thinking about the future. A 20 year old investor contributes $31,000 to a portfolio returning 8% annually. Without ever contributing another dime, their portfolio would be worth $1,000,000 dollars when they retire at age 65! To have the same portfolio value with at age 65 with the same annual return, a 40 year old investor would have to make a 1 time contribution of $146,000, and a 50 year old investor would have to contribute $315,000! Investing $600 a month for 30 years assuming 10% returns yields $1.2 Million dollars! It’s a shame that every college student (or even 5th grader for that matter) doesn’t know that fact. If everyone knew the power of compound interest, I think more people would make an effort to put aside a few bucks a month.Try to pack a lunch and cut back on the Starbucks a little bit. You will thank yourself later! Considering this, all an investor really needs to do is get their money into the market and leave it there! That might still seem easier said than done. How do you know what to invest in? Is it worth it to pay a manager? The Bogleheads’ Guide gives a great recap of the different asset classes. They discuss several different equity and bond. This was probably the driest section of this book (I’ll admit I skimmed through a fair amount of the Bond classes). However, there is a lot of good information there. One thing I liked about the Bogleheads’ guide is that they quoted tons of long term academic studies. According to countless studies, around 70-80% of index funds outperform actively managed funds. If Warren Buffet can’t pick stock market winners, what hope is there for the average investor? The funny thing is, when it comes to the stock market it actually pays to be lazy. Invest in low cost mutual funds, and leave your investments alone. Don’t be swayed by talk shows, infomercials, or TV “experts” that claim to know the inside scoop on the next hot stocks. If they really knew what the market was going to do next do you think they’d still be a TV show host? If I knew which stocks were going to have crazy returns, I would invest every dime I had and retire! There are a lot of great low cost index funds out there from companies like Vanguard that offer low cost mutual funds with expense ratios around .2%. No one knows what the market will do next. Portfolio managers will probably charge you a 1-2% fee. That means that they need to achieve returns of at least 1-2% ABOVE the market average to pay off. If 70% of them are underperforming the market, you need to get pretty lucky for your manager to pay off. You can’t control market returns, but you can control your own costs! The Bogleheads’ Guide also give a great recap of Asset Allocation. A general rule of thumb is to hold your age in bonds. Ex: a 20 year old holds 80% stocks, 20% bonds, a 30 year old holds 70% stocks 30% bonds. They even give a few examples of potential portfolios for investors of different ages. The Bogleheads’ guide gets into all the different types of investment accounts, both traditional and tax deferred accounts. They discuss college funds, and estate planning, how to establish a target retirement amount, how much money you can withdraw in retirement, etc. It’s all great stuff to be aware of, but are probably not the most exciting topics for young investors. 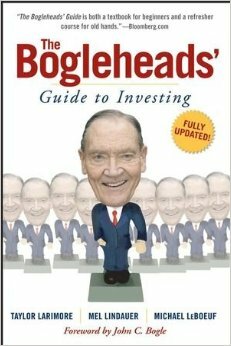 The Bogleheads’ Guide is a great book for anyone who is new to investing. Everyone should have to read this book or something similar to it in school. It is really a shame that our school systems don’t prepare us for our financial futures. Maybe this is why so many American’s end up with massive credit card debts. When you are ready to have your investing epiphany, pick up a copy of The Bogleheads’ Guide to Investing, or another similar book. There are tons of theories on how/where you should invest, but they will all agree that you need to have money to invest in the first place! That means being smart with the money you have, and living within your means. Be aware of where your money is going, and take control of your financial future now. Years down the road, you will be happy you did! Readers, what did you think of the Bogleheads’ strategy? Do you have any other similar books you recommend? Don’t forget to leave a comment to be entered to win one of two copies of the book. Great review! I have heard a lot of good things about this book, and sadly haven’t gotten around to reading it (I would love to!). I did read “The Little Book of Common Sense Investing” a while ago, though, and it was full of good information as well. I agree that books like this should be required to read in school. It’s such a shame most of us come out of college with little to no knowledge of making our money work for ourselves. Cool that one is on my list too. Or maybe you’d be interested in doing a guest post review on the site? 🙂 Let me know, always up for exchanging ideas with other bloggers. Well it won’t get you rich quick. Nice review! I read the Boglehead forums a lot. Tons of great information from people that are smart with with money. Yea it’s pretty cool to be able to post questions on the BH forum and get such quality responses for free. Many people, including professionals, cannot beat the market. 85% of fund managers cannot. Even the professional money managers, if they by chance happen to beat the market, take 1-2% off the top. There is no way they can beat the market, by 1-2%, consistently. There has even been a study that says an average non-professional cannot even beat the rate of inflation. I have bought stocks individually. I have seen them go up, and go down, but my 401K that I can’t monkey with out performs all. Same here, I’ve done/do individual stocks but keep it simple with ultra low cost index funds in my retirement accounts. More GREAT words for the GEN x and GEN y folks.. It is very true so many folks coming out of college just have NO clue about personal finance because its not taught…. The first 5 years out of college are SO CRITICAL to setting one’s self up for the future. I slacked off on that for a year or 2 but the last 5 years have been overboard on it and at this point I am WAY ahead of the curve of life for the things I want.. I have very little worry about the future and no doubt I will have a great standard of living in retirement. A book like this would make a GREAT gift for the recent graduates coming out of college this spring!!! Do them all a favor and get them on the right track!! Yea it’s too bad it isn’t taught. The only people who will learn are the self-motivated ones and that tends to only be a minority. I realized the value of personal finance knowledge early on and it has really made a difference with investments, career, pretty much everything. Has anything changed in recent years? Still mostly following the index funds strategy. Nope nothing has really changed, maybe shorten the duration on your bond funds but that’s about it 🙂 If you’ve been indexing the past few years you should be a happy camper right about now.